How many times have you bought a detective game hoping to feel like Sherlock Holmes and got disappointed? I'll tell you. Too many. Detective games are broken, most of them at least. These games should be about feeling like the smartest person in the room. Seeing what everybody else missed and connecting the dots. Getting to that wonderful moment in which everything clicks and you figure out what's going on. More info and sub-themes coming soon to get your minds working. Meanwhile check out Mark Brown's video on detective games or read my article on Gamasutra. You can also find a team for the jam on Crowdforge. And don't forget to join our Discord server! -> What is exactly a detective game? Something that tries to make you feel like a detective. How to interpret that is entirely up to you. -> Are board games allowed? Board games, pen & paper, alternate reality (somebody make one of these please), VR, etc. Everything's allowed. -> I can't work on my game all that time, some people have jobs. We don't expect you to use all the time. Make a game in a week, a day or an hour. -> What are those sub-themes you talk about? Just some extra restrictions that are entirely optional. I'll announce them a week before the jam starts. Damn it! We're trying to fix the world over here, forget about stupid prizes, this is not a competition. Cases are sub-themes, extra restrictions that are completely optional. Feel free to ignore them or choose as many as you want to get some inspiration. One new case will be revealed each day until the jam starts. - The secret of the abandoned museum: Make something in which, one or more challenges, take place out of the game itself. Whether it's researching, doing a simple experiment or finding a certain object/place. How cool would it be if you had to go to nearby libraries and find a certain book? - The case of the missing interpreter: Make something that features an unconventional dialogue mechanic. Maybe you find puzzle pieces to put together a message or play a card game to make your suspect confess. Try something that doesn't look at all like a classic dialogue tree. - The mysterious criminal consultant: Team up with somebody who doesn't make games and use their skills to craft a unique game. Do you have a friend who works as a journalist? Lawyer? Dancer? Doctor? Architect? Comedian? Photographer? Work together on design and narrative. - The underground Berlin council: Make something that uses procedurally generated elements. Try to think beyond map generation. Create full storylines, characters, relationships or whatever you can come up with. - An unexpected guest: Make a multiplayer game, it can be either cooperative or competitive. Maybe you're working together to solve a mystery, sharing clues over a chat or maybe one of you is a murderer and the other a detective. - The theft of The Persistence of Memory: Forget about realistic stories and environments. Make a game that draws from surrealism (in terms of art or narrative). Imagine new worlds with strange plots and mechanics. - The lost magnifying glass: Make a game that is accessible to players with disabilities. Think of people who can't enjoy most games and create something they'll love, better yet! Design your core mechanics to suit a certain disability. - And then there was one: Make a game with a unique set of characters. Diversity is cool, games need more of it. Let's create environments and narratives around characters that we don't usually see in our medium. Try to go beyond cis white males in their twenties. - A strong drink: Take a well-known videogame genre and try to use its mechanics to bring something new to detective games. Can you use a RTS to make a good detective game? What about solving a murder while driving a cab around? - The secret of eternal life: Take care of yourself during the jam. Have nice meals, get enough sleep hours and take breaks to chat with others or go for a walk. If your game concept is pushing you too hard then it isn't the right concept. 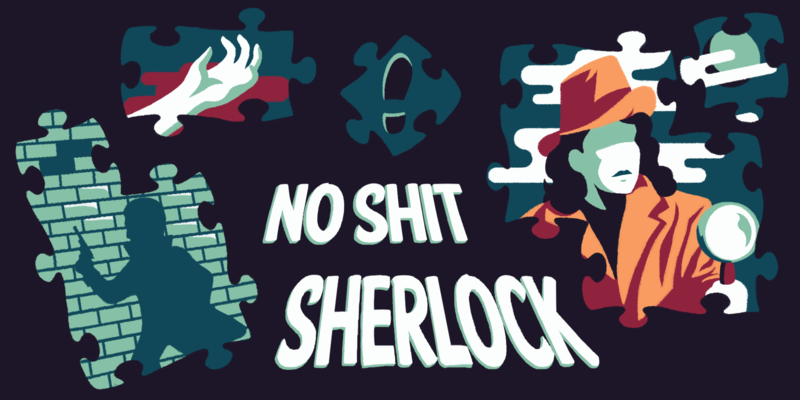 Use #NoShitSherlockJam to talk about the jam on twitter and feel free to use the forums. Short detective story in outer space. One colony, one victim, eight suspects. What is happening in Bottom-Right? Would Inspector Jael be able to discover who is behind the nasty crimes? Solve the mystery of Mathew who is missing. Text-based mystery with a pinch of humor. Help the world's greatest detective solve his last case. A short RPG Maker game where you solve a murder mystery. It's as unpolished as they come. Which of your pets is the culprit? A 70s newspaper, but something's not right. A valiant attempt to adapt the works of Arthur Conan Doyle to Interactive Fiction.